Yes...that's right. It has been confirmed. The office I work at has been flooded. If you look at the picture above from the Brewton Standard website, you will see a orange colored building. That would be where I work. Why does this always happen to us? I guess my last few days working there will be in the midst of fans and other equipment to dry the place out. Gosh, this is not how I wanted to spend my last few days. Oh Brenna,that is terrible! 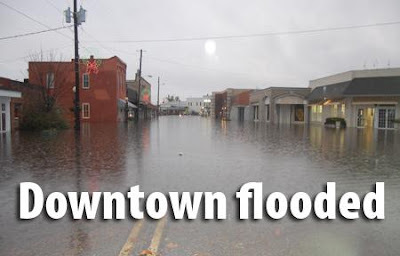 Judd always says that downtown floods easily. I guess he was right. Did it reach the people at the Hourglass? I would worry living in the flood zone. Let me know if I can do anything.